The story of Rem is made of enchanting memories, of small joys which add sparkle to life as it slips through turquoise blue waters. The Eau de Parfum Rem by Reminiscence is the exact expression of the little details that makes all the difference. The final but essential touch composed of a little “je ne sais quoi” that defines elegance. The ever-present marine note, Rem’s signature, unfolds into a rosy floral accord to deliver a very warm and sensual base of oriental vanilla and tonka bean notes. Heady and generous, its oriental character is a real success. Crafted by Robertet in the image of a luxury jewelry gem, it is composed of precious luxury materials. A harmonious blend of gracefulness. A sensual trail for a sophisticated woman with a carnal femininity. A woman with a particular, mysterious and original presence, enhanced by a spicy aura combined with a breezy marine veil. Rem Eau de Parfum is presented in a deep and intense blue reminiscent of the South Seas and offers a palette of remarkable and noble scents for a refined and elegant woman. 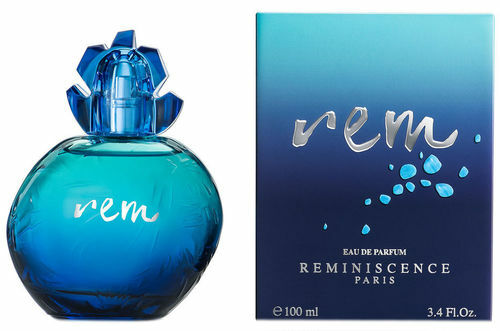 Rem is declined in an intense version : the Eau de Parfum. An Oriental signature for a more sophisticated and sensual version. The ever-present marine note, REM’s signature, unfolds into a rosy floral accord to deliver a very warm and sensual base of oriental Vanilla and Tonka bean notes. A palette of remarkable and noble scents for a refined and elegant woman.